The U.S. Environmental Protection Agency says Michigan and 19 other states have complied with a 2008 rule to reduce their pollution that was drifting into other states. But air quality experts say there's much more to be done. Ozone is a harmful gas created when sunshine, heat and pollutants like nitrogen oxides and volatile organic compounds interact. Those pollutants, which come from power plants, manufacturing, and vehicles, can drift from one state to another. Janice Nolen is with the American Lung Association. Nolen writes the group's annual State of the Air report. She says a 2008 cross state pollution rule helped a lot of states lower ozone pollution. But it didn't work for some, like Maryland and Delaware, which are still dealing with being out of compliance with federal ozone standards. Nor did it work for Muskegon, Allegan and Berrien counties in Michigan. "These are all counties where you have high levels of air pollution, of ozone pollution, that EPA estimates is coming from Chicago," says Nolen. But Nolan says the EPA, so far, has declined to enforce the updated, 2015, cross state pollution rule. 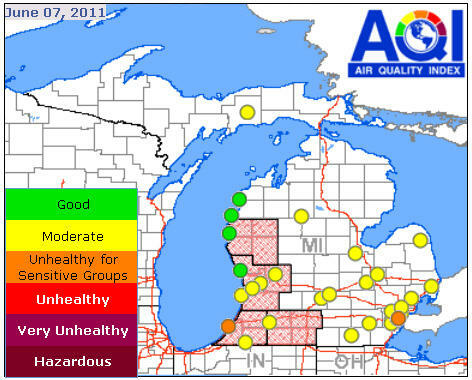 If it did, Chicago might have to reduce its pollution even more, so people in west Michigan could breathe more freely. Nolan says the EPA could be petitioned by states like Michigan to see if states like Illinois should be doing more under the 2015 rule. They should, she says: 0zone causes asthma attacks and people can die from asthma attacks. "So it's a serious health threat, and what we've learned is that the level we used to think was safe, isn't," she says.